VMware gets a nod from me for providing such an aggressive number of updates and features in small development windows. I rarely encounter a bug that creates a show stopper. However, this latest issue with hosts crashing when upgrading to vCenter 5 is a bit of a worry, and I’m hoping to shine some light on it to prevent any others from encountering it. Kudos to Mike Laskowski who pointed out this issue to me to share with you. Also, Ron Singler over at the Ruptured Monkey shares another tale of woe. For those not aware, PSOD is the Purple Screen of Death, a cousin to the Blue Screen of Death (BSOD) seen in the world of Windows. It is the result of a vSphere host hitting a condition that causes a dump of crash details in a specific format, with a background being a pink/purple tinge. 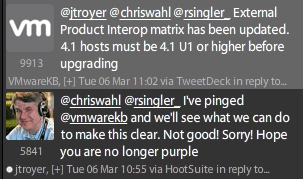 The problem I have with this is that the compatibility matrix clearly shows ESX / ESXi 4.1 (Build 260247) being compatible with vCenter 5. 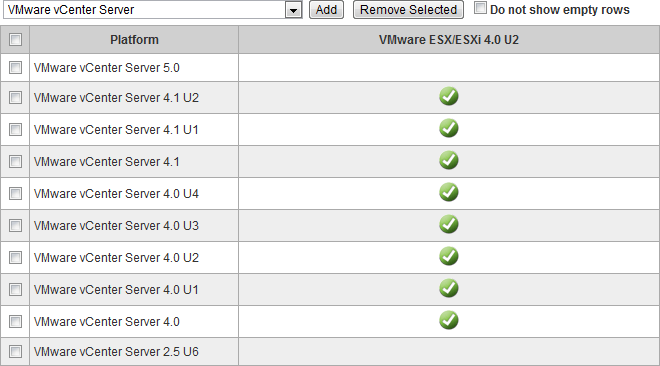 I think there should be an asterisk linking to the KB, or just removing the green check mark for vCenter 5.0. Thanks to John Troyer for routing the details internally, the matrix has been updated! The power of the Twitterverse! Use the host build number to determine your update level. I’ll show you two simple methods on my home lab which is running ESXi 5.0 build 469512. I often refer to this ESXi Wikipedia page to translate a build number into an update level (not the most high tech method, but it works and is easy to access). The first method is by connecting to vCenter or your ESX / ESXi host with the vSphere Client. The build number is part of the host description above the summary tab. Ensure that your vSphere hosts are running a minimum of ESX / ESXi 4.1 update 1 before upgrading vCenter. Realistically, you should already be running 4.1 update 1 anyway (or perhaps even update 2), but I understand that isn’t always possible for all environments. There is also apparently a problem with upgrading to vCenter 5 when using ESX 4 update 2 hosts. I am busy going through this process myself with a particular vCenter / ESX cluster, and have made sure to upgrade the ESX 4 hosts to update 4 to avoid this! The compatibility matrix at least shows the correct info (i.e. ESX 4 update 2 hosts not being compatible with vCenter 5). If you check update 1, 3 and 4 they all show as compatible except of course update 2! Good info, I’ve added it to the post and given you credit. A purple screen of death (PSOD) may occur on hosts running ESXi 4.0 releases between Patch03 (build 219382) and Patch09 (build 360236).This occurs when the host is being managed by vCenter 5.0 in a cluster with HA enabled and VPXA agent gets reinstalled on the host e.g. if the host was removed and re-added into the vCenter inventory. With this fix, hosts are allowed to be managed by vCenter and the ESX 4.0 hosts does not PSOD.